but this was new info to me and maybe it is to you too. to be large enough to fit in the frame needing a new subject. Church in West Orange, New Jersey. 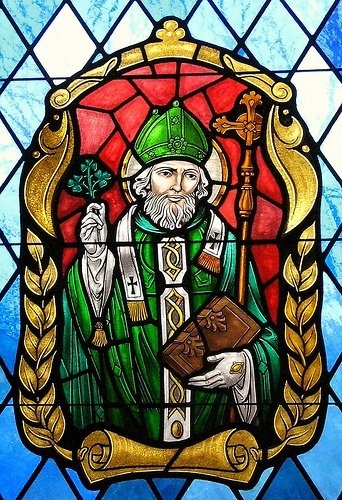 It depicts Saint Patrick, the patron saint of Ireland. gospel to the people of Ireland in the 5th Century. 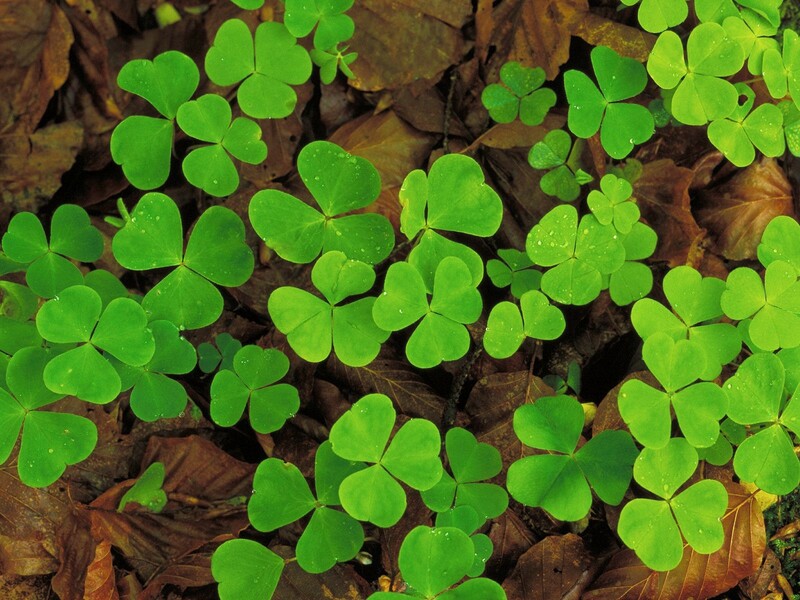 At that time, many Irish were pagan or Druid worshippers. shamrock, a familiar plant to the Irish, as a visual example. (and I'm a computer dummy). In Step 1 you upload your image to their website. Tell the program if you want the image to be "portrait"
(or vertical) or "landscape" (or horizontal). that's how the image will be "delivered" to you on your printer. I could just add something to the sides to fill it out. your image will be after it is pieced together. your printer gets to work printing out the image page by page. the color printer but you can print your image in color. together (if your image is larger than 8.5" x 11"). the image will fit on the acrylic in the frame I purchased. would be lighter to work with than a sheet of real glass. that could be cut to size but I was shocked at the prices. Michael's. It was only $12.50 and already the correct size. black rails could still fit on top and hold everything together. pull it off the side you will be putting the paint on. "It's a sign." I love that quote from "Sleepless In Seattle". of the frame's interior (and of the acrylic sheet). because my image was a little smaller than I actually needed. St. Patrick's head (red in the original image). on the dark parts of the image so I could see them easily. to more or less trace it with the black leading paint. If you are using the Block Poster image to transfer wording, etc. and use some type of carbon paper to trace over the image. the faux leading lines with the special paint. thicker than I wanted it...let that be a lesson to you. before you start adding the fill colors. Gallery Glass paints are available at most craft stores. it to completely cover a surface. Also pictured with the paints above is a paint pen. Some of the colors were changed from the original. tan from a bottle so I put it only lightly on his face. he is going to be on a green wall and then his face looks green. put behind his face until I can learn how to give him good color. was really being used like a stained glass window. shades of a color were marbleized together. St. Patrick got secured in the frame with black electrical tape. I thought that if any of it showed, it would look like leading. them light enough not to show...need to fix that. That is gosh darn amazing! Thanks so much for this great tip. I've always wondered how to enlarge something. I'm sure that I'll use this for bunches of projects. 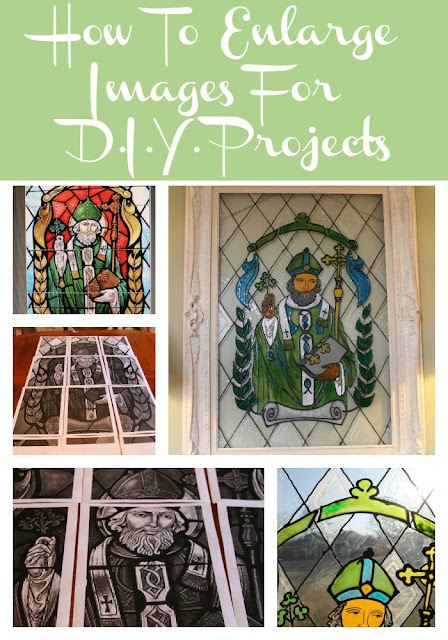 Your lovely "stain glass" St Patrick project is more of the feature here. It seems like it was so intricate to do and the results simply fabulous! Don't know how you had the patience to do this but was well worth it. The first time I used block poster I did a tree and it was like a puzzle to put together. The way you laid out your picture seems so much easier. Thanks for sharing. This is fabulous, Gayle! It turned out gorgeous. I've never heard of the site to enlarge prints. I loved your 50 shades of white too! You are amazing!!!! I just know I would never be able to pull this off! You did such a beautiful job! I may have to commission you to make one for me! I'm totally in love with this project! I've been wanting to so some leading on my casement windows and this is a great way to practice it first. Pinning.